Mornings are a mad house around here. With so many kids and some of them going to different schools, it’s complete chaos on weekdays between 6 a.m. and 8:10! 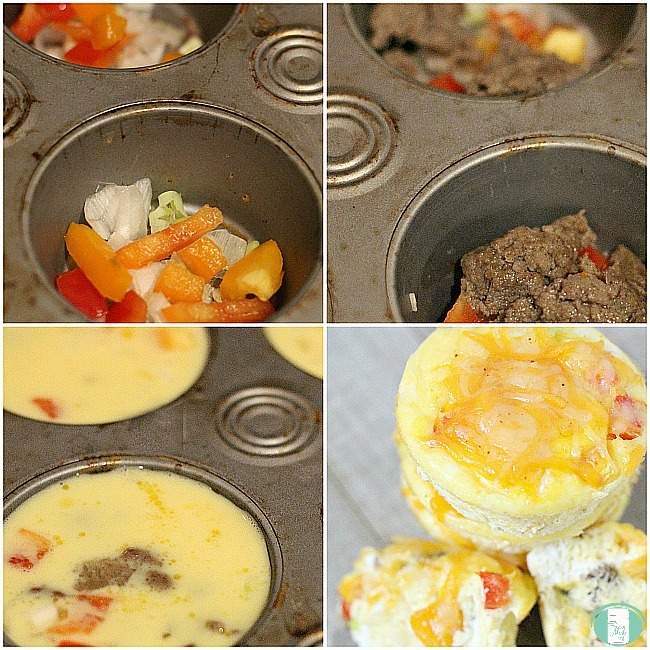 Having ready to go breakfasts like these taco breakfast cups make mornings so much easier. If you’re really in a rush, you can even wrap these in a paper towel and eat them on your way out the door. Generously grease a muffin tin. Brown the turkey sausage in a skillet with the taco seasoning mixed in. Dice the green onions and peppers. 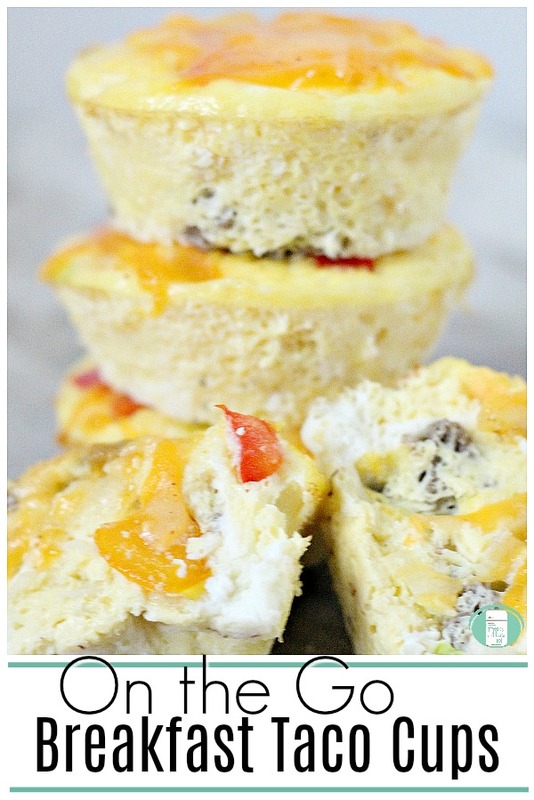 Place a spoon full of the diced vegetables in the bottom of each greased muffin tin. Next, layer a spoon of turkey sausage on top. In a small mixing bowl, mix together the beaten eggs and milk. 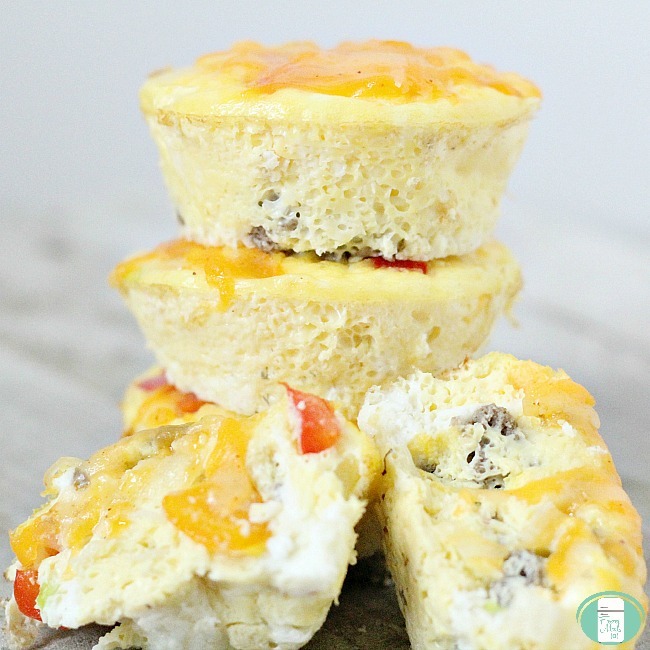 Fill each of the muffin tins to the top with the egg mixture. 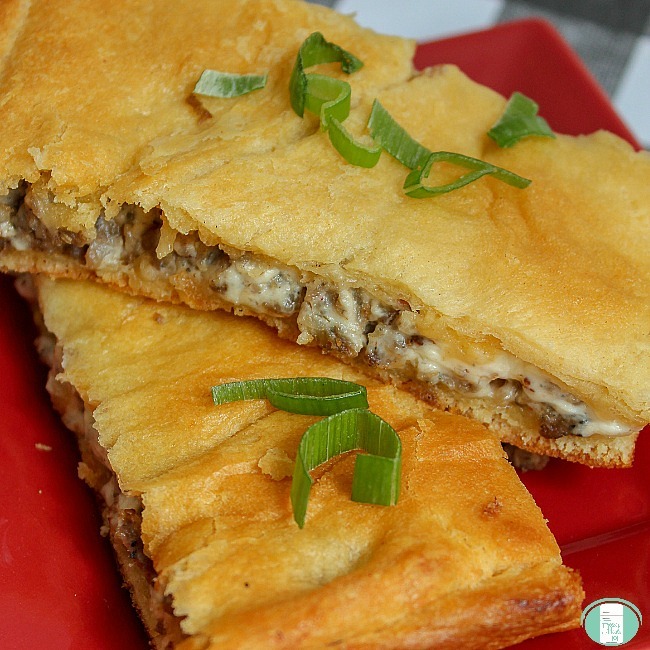 Top each one with grated cheese and put back in the oven just until the cheese is melted. Eat immediately or allow to cool before placing the egg cups in a large resealable bag and freezing. If you want, you can dip these in salsa. *I find that if you reheat them in the microwave without using paper towel, they get a bit soggy. No one wants soggy eggs, so be sure not to skip this step. 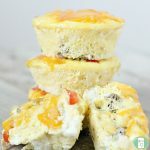 If you substitute whipping cream for the milk, then these taco breakfast cups are keto friendly. They are also gluten free provided you use gluten free taco seasoning. To reheat, take out as many egg cups as you need. Wrap the egg cup in a paper towel and place on a plate. Heat in the microwave just until warm. I find that if you reheat them in the microwave without using paper towel, they get a bit soggy. No one wants soggy eggs, so be sure not to skip this step. Breakfast is often called the most important meal of the day, but if you’re a mom trying to get kids out the door to school or activities, you know how hard it can be to make it healthy in the time you have. 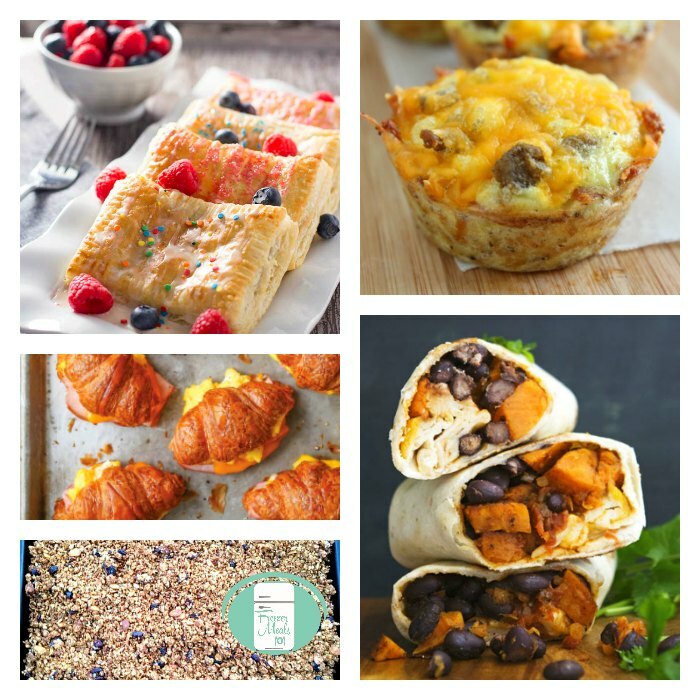 Enter the hero of our story, breakfast freezer meal recipes! 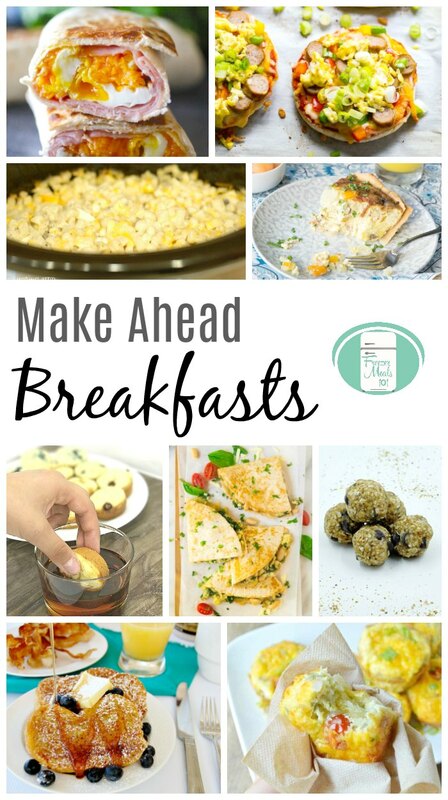 By taking some time on the weekend or an evening, you can make breakfasts ahead of time. This takes the rush out of those busy weekday mornings and still allows you to get in the nutrition you can feel good about. 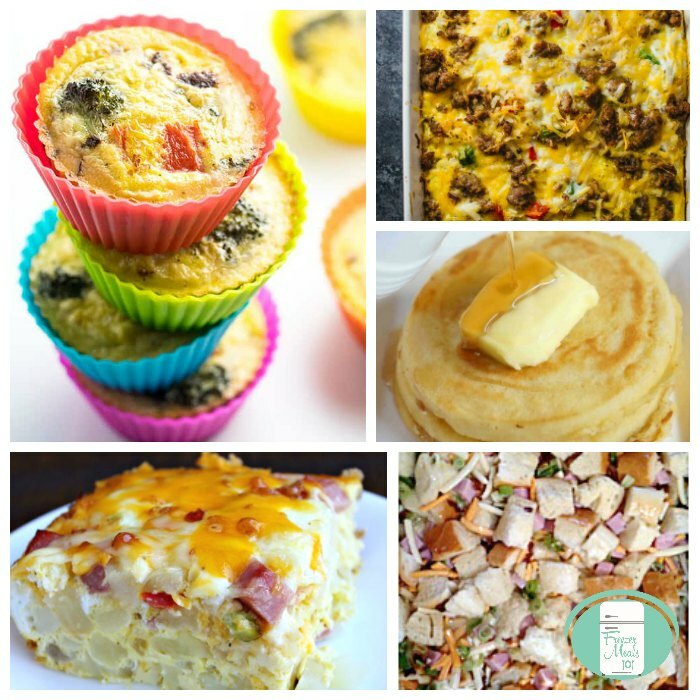 Check out our Breakfast Freezer Meal Plan for everything you need to save your weekday mornings! 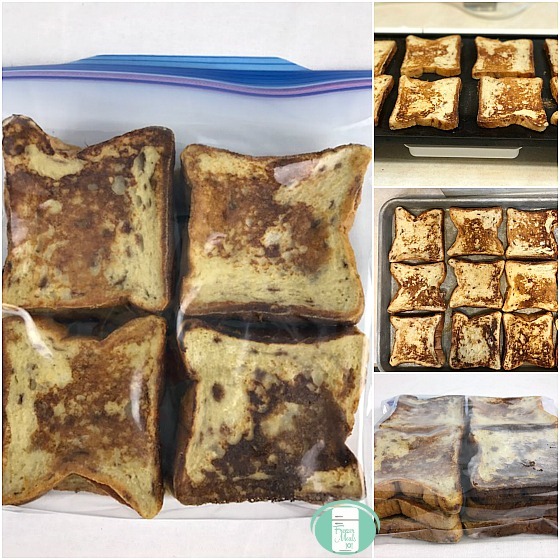 It includes recipes, shopping lists and printable labels so that you can easily fill your freezer with breakfasts for those busy days. Having breakfasts ready to go in the freezer is a game changer for busy mornings. It has saved me many a time, particularly if we have an early morning appointment to get to. 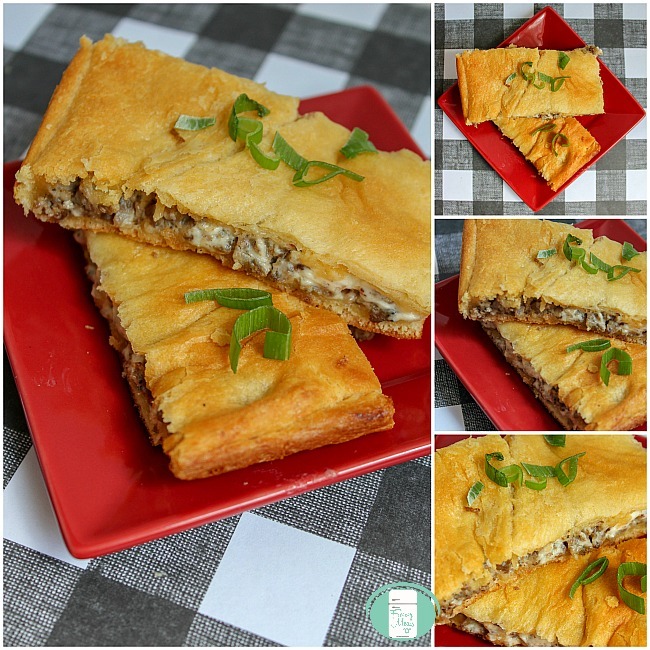 I hope these breakfast freezer meal recipes give you a head start on your days! These make ahead pancake mini muffins are wonderful to have in the freezer. My youngest daughter loves having some of these as an after school snack. The other kids prefer having them for breakfast, but no matter when they eat them, they are a hit! 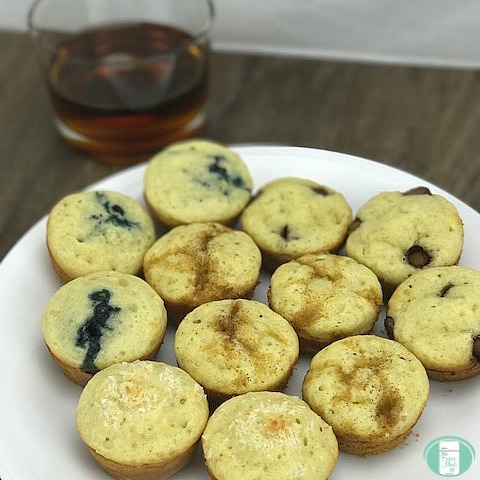 I like to make these pancake mini muffins in large batches. This is why I usually double or triple the recipe. I bake them and whatever is left after the kids get their hands on them, goes into freezer bags and is frozen. That way, you have an ultra-fast breakfast ready whenever you need them. 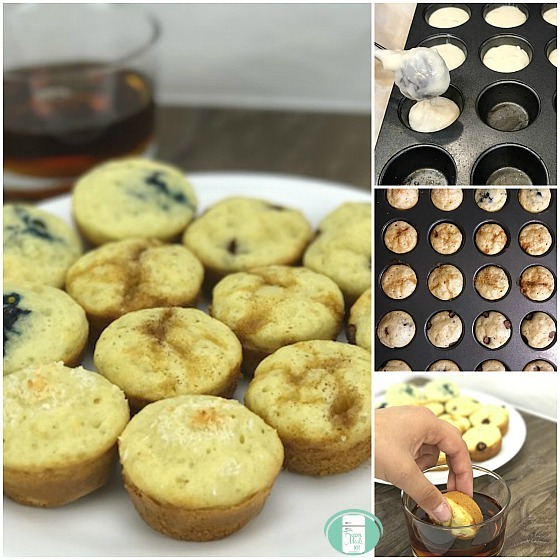 The best thing about this pancake mini muffin recipe is how easy it is to customize them and create different variations. *If you don’t have buttermilk on hand, add 2 Tbsp. of vinegar or lemon juice to the milk. Stir and let it sit for a few minutes before including it in the recipe. In a bowl, mix together flour, sugar, baking powder, baking soda, and salt. In a separate bowl, mix together the buttermilk, eggs and melted butter. Pour the liquid mixture into the dry mixture and stir until just combined. 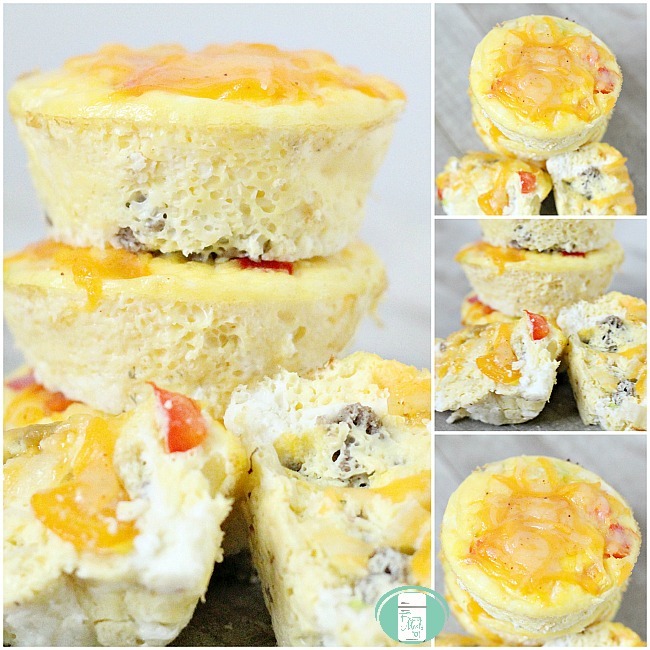 Grease mini muffin tins. Use a spoon or cookie dough scoop to fill the muffin tin compartments 2/3 of the way full. Add any toppings you wish at this point. For ours, I added chocolate chips to some, blueberries to some, coconut to some, and brown sugar and cinnamon to the others. Bake in 400° oven for 10-12 minutes. Serve as they are or dip in syrup. Once the pancake mini muffins are cooled, place them in a large resealable freezer bag. Remove the excess air and freeze. When you want to eat them, take out as many as you want and reheat in the microwave, being sure to reseal the bag well. 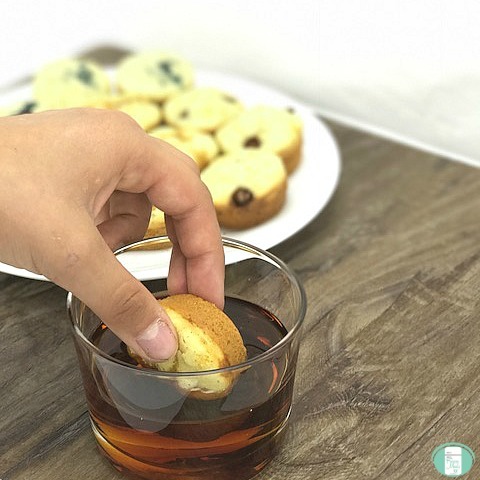 Some of my kids prefer to eat their mini pancake muffins cold, so experiment to find which you prefer. 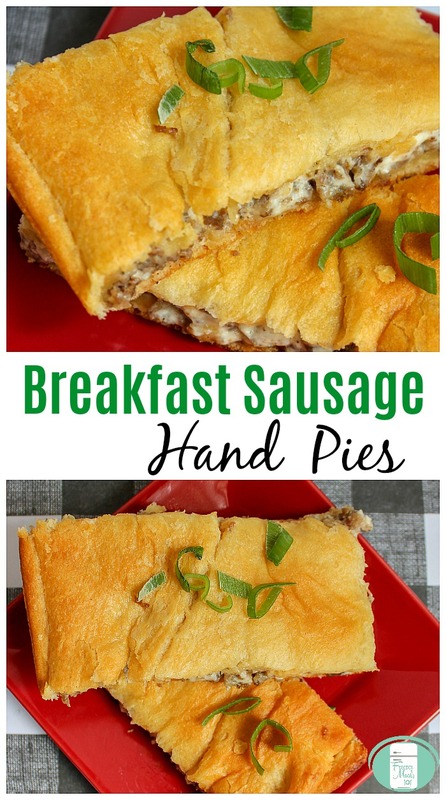 These are great for packing in school lunches, as snacks or for busy morning breakfasts. I am half French Canadian. Traditional French Canadian food basically makes sugar a food group! Seriously, there’s Tarte au Sucre (which translates directly into Sugar Pie! ), crepes with maple syrup and brown sugar, taffy, tourquettes (made by pouring boiling maple syrup over snow), and butter tarts. So if you’re French Canadian and you have the option of adding brown sugar or syrup to something or preferably both (! ), the answer is always yes. Obviously, these are healthier without the extra sugar of dipping them in syrup, but I dip mine. The only mini pancakes I wouldn’t recommend dipping are the ones with more savoury toppings like goat cheese and rosemary. Some of my kids are dippers while others prefer to eat these plain. Ultimately, the choice of whether to dip your little pancakes or not to is entirely up to you. 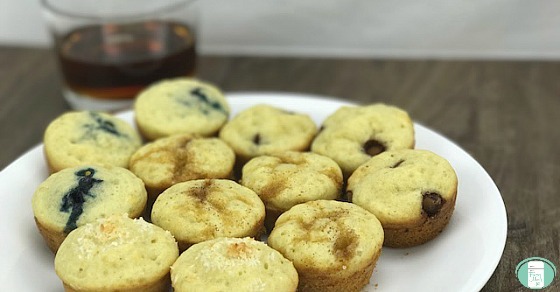 These make ahead pancake mini muffins are wonderful to have in the freezer. In a bowl, mix together flour, sugar, baking powder, baking soda, and salt. In a separate bowl, mix together buttermilk, eggs and melted butter. Use a spoon or cookie dough scoop to fill the muffin tin compartments 2/3 of the way full. Add any toppings you wish at this point. Bake in 400° oven for 10-12 minutes. Serve as they are or dip in syrup. 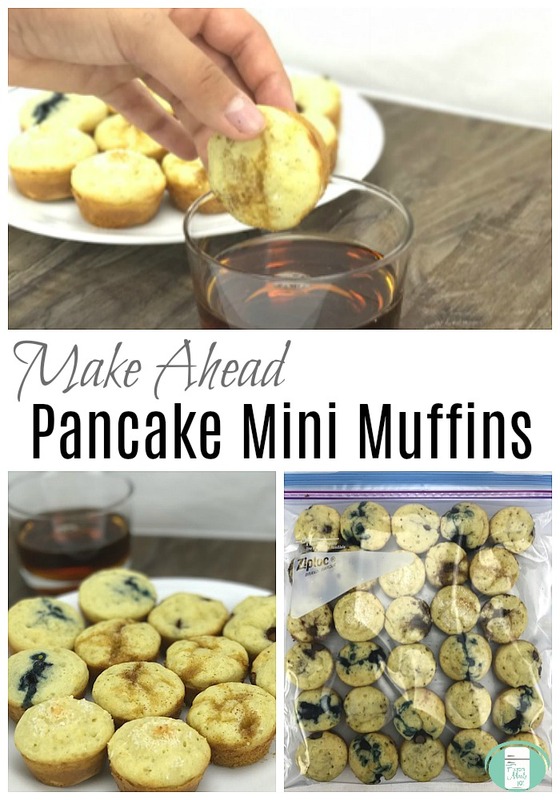 Once the pancake mini muffins are cooled, place them in a large resealable freezer bag. Remove excess air and freeze. When you want to eat them, take out as many as you want and reheat in the microwave, being sure to reseal the bag. *If you don't have buttermilk on hand, add 2 Tbsp. of vinegar or lemon juice to the milk. Stir and let it sit for a few minutes before including it in the recipe. You can find other make ahead breakfast recipes as well as the printable shopping lists and labels in our Breakfast Freezer Meal Plan. 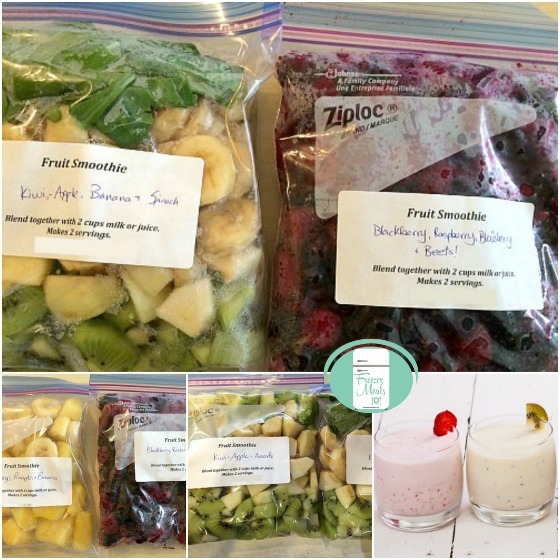 These make ahead freezer smoothie bags can be made using all kinds of fruits and vegetables. It’s fun to try different combinations. My kids love having these in the freezer. Divide the blueberries, strawberries and bananas up into medium sized resealable freezer bags. Remove excess air, seal and freeze. To serve, add 2 cups of milk or fruit juice and blend in a blender or with a hand blender. Pour into glasses. Divide the mangos, pineapple, spinach, and avocado into other medium sized resealable bags. Remove excess air, seal and freeze. To serve, add 2 cups of milk or fruit juice and blend in a blender or with a hand blender. Pour into glasses. 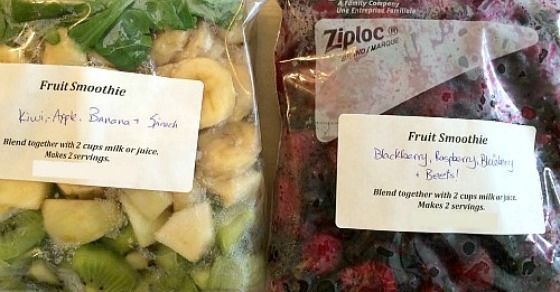 To make the smoothie bags, you can use fresh or frozen fruits or vegetables or a combination of both. Other ideas of what to include in the freezer smoothie bags include strawberries, cranberries, peaches, grapes, kale, broccoli, clementines, oranges, cantaloupe, and honeydew melon. You can also freeze yogourt by pouring it into an ice cube tray and freezing and then popping a few of the frozen yogourt cubes into your smoothie bags. The possibilities for variety with this are endless! This makes it easy to personalize and create smoothie bags that you and your family will love. You basically just need to stick to a ratio of 3 cups of any fruit/veggie combo and then when blending, add 2 cups of liquid. You can add in chia seeds, hemp seeds or flaxseed for added nutrients. If you or your kids like it, you can also toss in some unsweetened coconut in the bags. When serving smoothies for breakfast, you can make it a more complete meal by topping with granola such as our freezer granola. 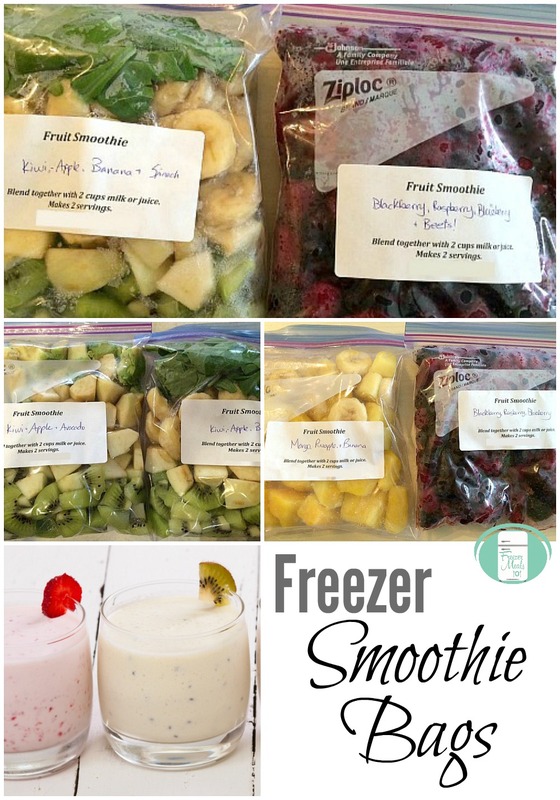 These make ahead freezer smoothie bags can be made using all kinds of fruits and vegetables. It's fun to try different combinations. Divide the blueberries, strawberries and bananas up into medium sized resealable freezer bags. To serve, add 2 cups of milk or fruit juice and blend in a blender or with a hand blender. Divide the mangos, pineapple, spinach, and avocado into other medium sized resealable bags. 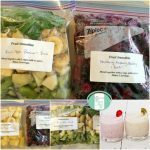 These freezer smoothie bags are one of the recipes included in our Breakfast Freezer Meal Plan along with other recipes, shopping lists, prep lists, and printable labels.